Below are two perspectives on the life and leadership of Dana McLean Greeley, the first by Jon M. Luopa and the second by Timothy Matlack Warren. Few figures in our denominational history embody our unique tensions as a religious movement as well as Dana McLean Greeley. Groomed by the New England Unitarianism of Channing, Emerson and Parker, he became an internationally respected advocate for world peace and interfaith understanding. Being in the crossfire of many denominational struggles of the mid-20th century, he remained optimistic about the future of Unitarian Universalism, and of the world, and lived without guile or bitterness among those who could not follow him. 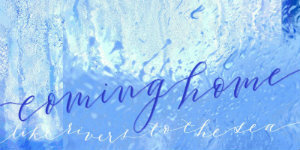 In the last years of his life when he struggled against a debilitating cancer, he remained hopeful and courageous. He devoted his life to an institution even as his primary religious inspiration was the unique worth and dignity of every person. A fifth-generation Unitarian, Dana was born on July 5, 1908 at 11 o’clock on a Sunday morning, the time of the week he liked best. The Greeleys hailed from Portland, Maine where their family pew was one behind the Longfellow pew at the historic First Parish Church. Dana grew up in Lexington, Massachusetts. In high school he served as president of the Theodore Parker Guild of the Young People’s Religious Union at the Lexington First Parish, and later during his college years he served as president of the continental YPRU. When he was a senior in high school, his younger sister, Rosamond, died of a ruptured appendix. This family tragedy was instrumental in his decision to enter the ministry. At Star Island he proposed to Deborah Webster, whom he had known since childhood, and they were married on December 27, 1931. He graduated from Harvard College in 1931 and from the Harvard Divinity School in 1933. Rev. Dana McLean Greeley and Mrs. Greeley. Photo by James K. O’Callaghan, Courtesy of the Boston Public Library Print Department. 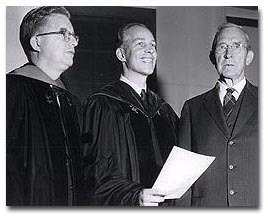 Dana served briefly two congregations—in Lincoln, Massachusetts and in Concord, New Hampshire—before being called to the Arlington Street Church in Boston in 1935. 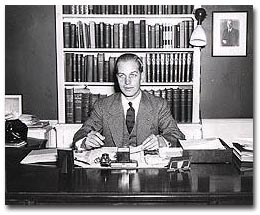 Dr. Samuel A. Eliot had served as minister there for eight years following his service as president of the American Unitarian Association for twenty-five years. Dana arrived in the autumn of 1935 in youthful vigor to rejuvenate the venerable institution. 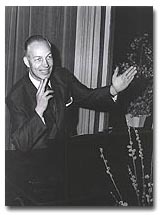 During his twenty-three year ministry at Arlington Street Church, he served on the Board of Directors of the Benevolent Fraternity of Unitarian Churches, a social service agency; as president of the North End Union, a settlement house; and on the American Unitarian Association Board of Trustees for twelve years where he chaired the World Churches Committee; served as secretary to the Board, and as a member of the executive committee. When his AUA board service ended, he became president of the Unitarian Service Committee in 1953. There had been only three presidents of the AUA since 1900: Samuel A. Eliot, Louis C. Cornish, and Frederick May Eliot. Dana announced his candidacy for the presidency in 1958. It was a contested election, the first in the 133 year history of the association. (The final tally was 823 votes for Dana and 720 for Dr. Ernest Kuebler, the candidate of the board of directors.) Dana noted, “I was a grass-roots candidate and a by-petition candidate, but I seemed nevertheless to be too Bostonian (which I was) and to represent the establishment.” Nearly fifty years old when elected in 1958, he would be the last president of the American Unitarian Association. Part of his platform had been merger with the Universalist Church of America. 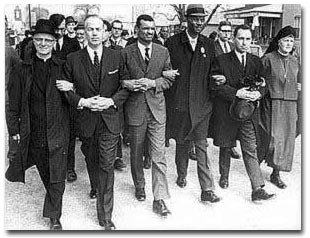 Boston’s Dr. Dana McLean Greeley (second left), a fellow Unitarian minister of James Reeb, links arms with other church leaders in the march through Selma. With him, from left, are Msgr. Daniel Cantwell of Chicago, Rev. C.T. Vivian, of Boston, Rev. 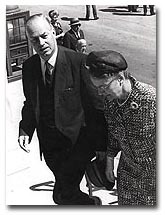 J.C. Killingsworth of Mississippi, Rabbi Eugene Weiner and Sister Rose Walker of New York City. The 4,000 marchers protested Rev. Reeb’s murder. Courtesy of the Boston Public Library Print Department. As early as 1900 there had been informal discussions between Unitarians and Universalists about cooperation on matters of mutual interest and concern. In some places cooperation had evolved into consolidation. 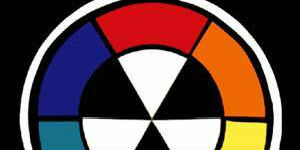 In 1959 the Western Unitarian Conference and several midwestern Universalist state conventions merged. When he became president of the AUA Dana was committed to complete merger between the Unitarians and the Universalists on the grounds of spiritual unity and collegiality. The two denominations were consolidated in 1961. One of the most difficult Board meetings over which Dana presided was that last one of the American Unitarian Association. Mindful that he had worked to create a new expression of liberal religion in America, Unitarian Universalism, he was also deeply aware that he was the man who helped close the history book on American Unitarianism. This feeling was to revisit him when he retired in 1969 as the president of the UUA. He stopped his desk clock the minute he moved out of his presidential office at 25 Beacon Street and placed this frozen time piece in his minister’s study in Concord, Massachusetts. Issues that recurred throughout recent history plagued his administration. When he became president of the AUA in 1958, he faced opposition from those people who wanted to split the office of the presidency into two positions, that of spiritual spokesperson for the denomination and that of administrative head. He struggled to achieve adequate coordination between field services and his administration. A plan to create seven regional service centers was never implemented. Crises around the viability of the Beacon Press and the lack of regular denominational news vehicles recurred. When the Service Committees of the two denominations merged, the Unitarians preferred independence from the UUA and the Universalists wanted to remain a denominational office as they had been.For many interfaith and international efforts were often of lower priority, yet Dana advocated their inclusion even when they were inadequately funded and staffed. 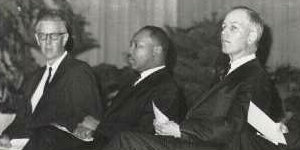 Befriending Dr. Martin Luther King, Jr. and involvement in the civil rights movement were of paramount importance to Dana. His efforts in trying to help the association accept its own institutional racism were less successful. This short sketch cannot do justice to that important ongoing challenge. Dana was an outspoken critic of American involvement in Southeast Asia and denounced nuclear proliferation. He was instrumental in the founding of the World Conference on Religion and Peace in 1962. He practiced a broad ecumenism long before his participation in the Second Vatican Council as a delegated observer. He was a birthright Unitarian with a universalist persona. He was as comfortable being with President Gerald Ford standing on the bridge over the Concord River at our nation’s bicentennial in 1976 as he was conversing with Dr. Albert Schweitzer in Lambarene. The Universalists of the Phillipines, the Unitarians in the Khasi Hills of India, and the Rissho Kosei Kai of Japan, were as much his congregation as the cherished folk of Lexington, Concord, and Boston. After retiring as president of the UUA in 1969, he served as a visiting professor for one year at the Meadville/Lombard Theological School in Chicago. From there he went to serve the First Parish in Concord, Massachusetts, where he died June 13, 1986. The Rev. 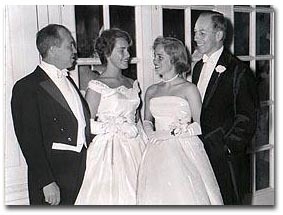 Dr. Dana McLean Greeley, minister of the Arlington Street Church, with his wife, Deborah, and two of their four daughters, Penelope, 17, left, and Faith, right, 24. Photo by Calvin Campbell, Courtesy of the Boston Public Library Print Department. It is six and one half miles from the house close by the Battle Green in Lexington to the house on Main Street in Concord. For Dana Greeley the odyssey from one to the other lasted forty-six years. The maelstroms, the challenges, the triumphs of that odyssey revealed a man with sufficient energy, optimism and moral courage to stay the course. Who was this man? Did he himself know who he really was? Why did he choose the ministry? Would he secretly have rather been a professional baseball player? On July 5, 1908 Dana was born in his grandparents’ house in Lexington, Massachusetts. In 1912 he moved into a large brick house which his father had built. When Dana was 16, the family bought a large white frame house on Massachusetts Avenue in the shadow of the Battle Green and the First Parish Church, Unitarian. 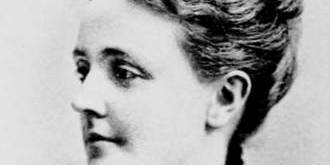 Dana’s mother, Marjory Ellen Houghton, was born in Lexington and graduated from Radcliffe. Her husband, William Roger Greeley, was born in Lexington in 1881 and died there in 1966. He was a Boston architect, a city planner, and a graduate of M. I. T. As a boy Dana was secure in a loving family and somewhat king of the roost at home although exercising that position with great affection. In addition to his younger brother, Roland, he had twin sisters, Ellen and Anne. If we are to observe him as he enters Lexington High School, we will begin to see his development. He is basking in the secure love of his family and he is about to embark on parallel interests that will absorb him. The first was athletics. He established a lifelong enthusiasm for sports of every stripe. He loved baseball. He was an indifferent student partly through disposition and partly through the distraction of sports. His parents began to despair about his being prepared for Harvard and so they proposed to send him to a preparatory school. As a consequence he went to Stearns School in New Hampshire after high school. Perhaps this was intended to remove him from the playing fields for a while but Dana states that, “At preparatory school I spent no less time in athletics, and I used to walk several miles on a Sunday evening, instead of studying, to attend Young People’s Religious Union meetings in the Unitarian Church in Milford, New Hampshire.” At any rate the move succeeded to the extent that Dana was admitted to Harvard the next year. 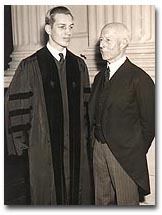 His father held many distinguished offices in the Unitarian denomination, in fact all of the major ones that were open to a layman, including being Moderator of the American Unitarian Association. His mother was almost equally active in church and town affairs, and at one time was a director of the Continental Women’s organization known as the General Alliance. Inaugurated President of the American Unitarian Association at Arlington Street Church was the Rev. Dana McLean Greeley, D.D. (center). Others are the Rev. Harry B. Scholefield (left) and Lawrence G. Brooks. Courtesy of the Boston Public Library Print Department. Dana was eighteen years old when tragedy overtook the family. Rosamond, the oldest sister died suddenly of peritonitis at the age of 14. This left a pall over the family for some years. It was particularly poignant to Dana because he had indicated to her that he planned to enter the ministry. How serious was that intention we don’t know but it was probably viewed by Dana as a pledge that he ought to keep. Dana entered the Harvard College Class of 1931 and immediately joined the freshman wrestling team. He became a football running back in the Harvard backfield, the varsity GR backfield, as it was called, made up of Grant, Graves, Greeley and Gilligan. Dana’s writings about these times indicate his assessment of his scholarship. He felt close to Alfred North Whitehead from whom he took several courses, although he admitted in passing that he was not sure if he quite understood him. Dana’s boundless energy does not abate at Harvard. He became president of his fraternity and a member of the Board of Directors of the YPRU, and in his senior year while chairman of the Young People’s Conference at Star Island, he was elected president of the continental YPRU. We see developing here a record, never to be blemished, of winning election to every denominational office he ever sought. 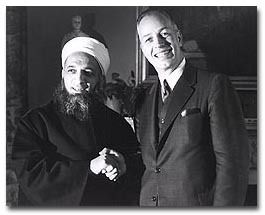 President Dr. Dana McLean Greeley of the Unitarian Universalist Association, 25 Beacon St., Boston, greets His Excellency Sheikh Ahmad Kuftaro, Grand Mufti of the Syrian Arab Republic, Damascus, S.A.R. during his Boston visit. Courtesy of the Boston Public Library Print Department. Dana did something far more important his freshman year than wrestle with theology and teammates. He and Debby became secretly engaged. Debby was that young women who as a girl had also lived on Somerset Road and who had moved with her family to the house on Massachusetts Avenue, the former parsonage of the First Parish Church. It was right smack dab next to the Greeley house. Debby was Deborah Allen Webster born also in Lexington, the daughter of Hollis Webster of Boston and Helen Fordham Noyes of Newton. Dana and Debby had a passing acquaintance at school and church young peoples’ activities. But they were not paying close attention to one another. Debby, as a matter of fact, had two dates with Roland, Dana’s brother. All that was to change when a classmate of Dana’s at Stearns came back from a Lexington visit and started to quiz him rather meaningfully about this Debby Webster whom he had met. Obviously fresh viewpoints opened up. Dana took Debby to the Harvard-Yale game, a ploy used by generations of Harvard men to make a serious romantic statement. It evidently worked and they remained secretly engaged for three years. They married in 1931. This marriage began with Dana enrolled as a student at Harvard Divinity School. Probably because it was in some ways a continuum of his Harvard studies, Dana, in reflecting on the Divinity School, comments, “It was the appointment of a Unitarian minister, Henry Ware, Sr., to the Hollis Professorship of Divinity there in 1805 that chiefly precipitated the historic Unitarian controversy and the ultimate split between the liberal and orthodox or Unitarian and Trinitarian wings of Congregationalism. All nine presidents of Harvard, from that year until 1933, when I graduated from the Divinity School, were Unitarians. While at Divinity School Dana was engaged as director of education at the Church of Disciples in the Fenway, the church of James Freeman Clarke, Elizabeth Peabody and Samuel and Julia Ward Howe. The education budget was $1500, including what seemed to Dana a munificent salary. It was during this tenure that Dana was to receive a phone call which was to launch him on his professional career. It came from the First Parish in Lincoln, Massachusetts asking him to candidate. He accepted and after an interim period of preaching at the church became its minister in January 1932. He was ordained on December 13, 1933. He had two happy years at Lincoln living on a salary of $1200. Dana with his lifelong lack of concern for money thought this sum generous. Debby perhaps thought otherwise. she was running the household and carrying their first child. While at Lincoln, one day he received a delegation from the church at Concord, New Hampshire. Dana succumbed to their pleadings and was soon installed at the Concord church with the additional endowed title of minister-at-large for the state of New Hampshire. The Concord ministry was soon to end because Dana was asked to exchange pulpits with Arlington Street Church, a process which subtly made him a candidate. Dr. Dana Greeley, back from Vietnam. Photo by Dan Murphy, Courtesy of the Boston Public Library Print Department. And sure enough he was offered that great pulpit. Should he accept? It was a difficult and agonizing decision to leave Concord in the lurch, so to speak, and to have the audacity to accept such a plum at such an early age. But accept it he did at the urging of Dr. Samuel Atkins Eliot, the former president of the American Unitarian Association and the minister at Arlington Street whom he was going to succeed. It would be hard to exaggerate the enormity of this undertaking and its emotional impact on Dana. Arlington Street was the mother church of Unitarianism under whose roof the AUA was founded. It was the great Channing’s pulpit and Dana must have felt his constant presence. 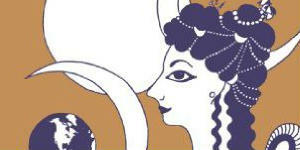 Dana was installed on November 4, 1935 at the age of twenty -seven. He had an important and conspicuous pulpit to speak from and the challenging administrative problems of an aging and shrinking congregation. He became increasingly active in larger church affairs and his passion for the denomination led to his election to the Board of the Benevolent Fraternity, the secretaryship of the AUA, the presidency of the Unitarian Service Committee and finally the presidency of the AUA. Significantly, it was during these years that he attended, as chair of the American delegation, his first congress of the International Association for Religious Freedom in Oxford, England. A new course was being set. Dana’s election as president of the AUA in 1958 meant leaving Arlington Street. The move was only across the Public Garden to 25 Beacon Street but the job was vastly different. Dana now had to administer, to lead, and to deal with a Board that, save for one member, had opposed his election. In the next eleven years, Dana’s energy, optimism, and charisma served him in good stead in leading the AUA into a union with the Universalists, in dealing with the black empowerment issue within the denomination, and in assuming a respected national role in race relations. He was uncompromisingly candid in his objection to the war in Vietnam. His stances brought national press attention. He was quoted widely and even photographed confronting the police chief of Selma, Alabama. Life magazine ran a photo interview of Dana exploring this obscure Boston-based denomination and its leader. Dana used the leverage of his office to advance those causes about which he cared so much: social justice, religious freedom, and above all, peace. Rev. 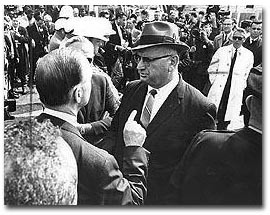 Dana McLean Greeley of Boston uses forefinger to emphasize his point while discussing rights of his followers with Selma’s Public SafetyDirector, Wilson Baker. Photo by Ollie Noonan Jr., Courtesy of the Boston Public Library Print Department. (He registered as a conscientious objector in the Second World War as a matter of principle, though he need not have done so since he was a clergyman.) He traveled around the world attending conferences and councils. The names of some of the organizations he supported and worked with indicate the breadth of his interests: the Massachusetts Council of Churches of which he was president; the Unitarian Universalist Fellowship for Social Justice; the Second Pacem in Terris Conference; the National Inter-Religious Conference on Peace; the World Conference on Religion for Peace, and the International Association for Religious Freedom, of which he was also president. During those years at Arlington Street and 25 Beacon Street, Dana and Debby were living at Charles River Square and Brimmer Street and raising four daughters: Faith, Rosamond, Cynthia, and Penelope. Dana was either talking with religious leaders in India, Japan, Transylvania, or in contrast presenting a daughter at a debutante cotillion. Debby has stated that he participated in this debutante ceremony with some hesitation and embarrassment, but when he stood there in his evening tails with his daughter on his arm, the joy of the occasion overtook him and his face was wreathed in that Dana smile. 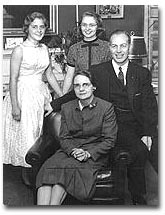 (Left to right) John H. Bishop of Weston, Judy Bishop, and Penelope Greeley and her father, the Rev. Dana McLean Greeley of Boston. Courtesy of the Boston Public Library Print Department. In 1969 Dana’s term as president of the UUA came to an end. In his 50th Reunion report, Dana told his Harvard classmates that the constitution required him to step down. He must have had mixed emotions about leaving. He had had his share of confrontations with his Board over money and policies, but he had the great satisfaction of having led his denomination onto center national stage in matters of peace, reconciliation, and ecumenicity. Now at 61 he could stand back and contemplate what to do next. While lecturing in Germany, he received a letter from the Concord church. This was followed by a luncheon in Boston after which committee members succeeded in getting Dana and Debby out to Concord for a look-see. A candidating week followed and a subsequent call to the pulpit by acclamation. Abigail Eliot stepped in serendipitously at this moment to offer her house at 276 Main Street to Dana and Debby. The house could not have been better suited to them. It was in town, on the river, and graciously Victorian. And it was endowed with a Unitarian past as the home of Grindall Reynolds, former minister of the First Parish. Arlington Street Church: Charles Frances Adams, right, and Rev. Dana McLean Greeley. Courtesy of the Boston Public Library Print Department. 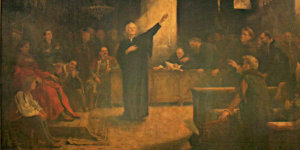 Dana settled into his ministry with his openness and conciliatory charm softening the divisions that had arisen from the prophetic but contentious earlier ministry. An admiring parish gave him the freedom and administrative support to allow him to continue to roam the globe for the International Association for Religious Freedom. In Concord he joined Rotary, played tennis, and spent some time in their beloved summer home in Georgetown, Maine. His genius for communication and his passion for ecumenical dialogue resulted in his playing a large part in bringing all the Concord ministers together for frequent breakfasts. Concord must have been an easy choice for Dana, the chance to get back to preaching and to minister to a smaller community than a denomination or indeed the world. The social and political ambiance of Concord would be completely familiar to him. He was soon president of the Thoreau Society of America. Dana seemed to have an Emersonian tug prodding him towards Concord. They both had an open mien that endeared them both to the townspeople: Emerson was recognized affectionately whether afoot or in carriage, and Dana was seen waving and grinning to all from his auto with the UNI-UNI license plate. When he died of cancer in 1986, his family and a caring community of friends from across the years filled the Concord Meetinghouse to celebrate his life. Greeley, Dana McLean. 25 Beacon Street and Other Recollections. Boston: Beacon Press, 1971. Greeley, Dana McLean. Forward Through the Ages: Writings of the Reverend Dana McLean Greeley, 1970 through 1986. Concord, MA, The First Parish in Concord, 1986.